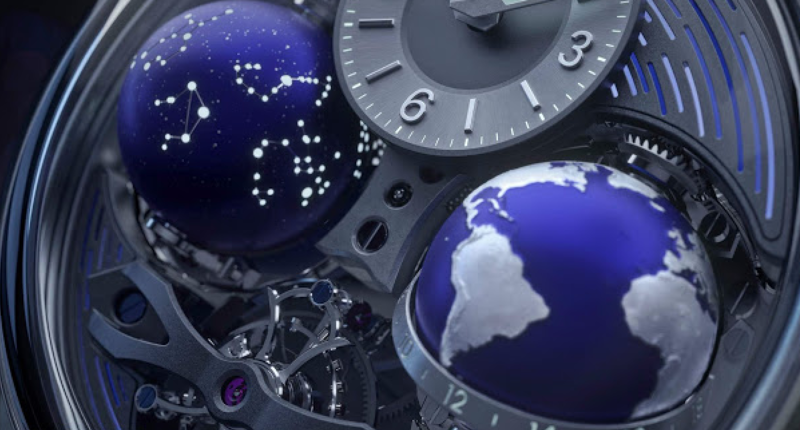 Bridges Cosmos; the Haute Horlogerie masterpiece presented by Girard-Perregaux in 2019. Two complete globes – celestial and terrestrial – serve to mirror a fusional moment that we experience the Cosmos. Revealing an unknown world, in turn, the signs of the zodiac pass through this miniature firmament, as the earth rotates daily. Like the sky, the watch has two faces: day and night. Loyal to the refinement characterising the aesthete of the invisible, Cosmos reveals finishes of a previously unknown beauty. Inside, setting Cosmos into orbit, beats brand-new Manufacture Calibre GP09320-1098. In the absence of a crown, the time and various indications are manually adjusted on the back of this stellar creation. 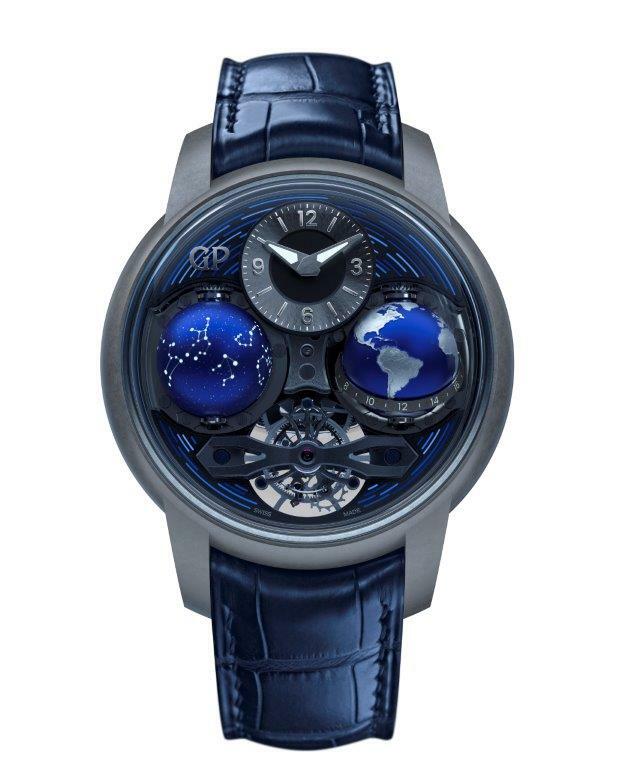 Within the galaxy of new Girard-Perregaux launches, Cosmos vibrates on a separate wavelength. Stemming from the Bridges collection, the piece highlighted by the brand in 2019 is anything but nebulous. It reveals the hidden portions of the night sky and glows with a black light. The centrepiece of the “Earth to Sky” theme, this watch with tourbillon, sky chart and world time complications is composed of mechanical particles and poetic paradoxes. 13.8 billion years after the expansion of the universe, Girard-Perregaux raises its eyes towards infinity: its light, its shadow and its mysteries. In a new approach, the brand begins a dialogue between earth and sky, between matter and space. It explores the boundaries of its expertise, unveils the invisible and reveals what was hidden. Its science of watch finishing and materials is exposed in a new light. It draws on the light of blackness. Science and art, photons and matter, Girard-Perregaux’s search for beauty is entering an astrophysical and metaphorical dimension. At 9 o’clock, the sky chart endows Cosmos with its sidereal dimension. Laser-engraved on a blue-tinted titanium globe, it rotates every 23 hours, 58 minutes and 4 seconds, the exact duration of a sidereal day. This sphere focuses on the best-known, most visible stellar formations, those of the zodiac. Dozens of stars are connected to it, thus tracing the twelve constellations known for more than 2,500 years. They are enhanced with luminescent hydroceramic, thus enabling the Cosmos to fulfil its astronomical vocation even on the darkest nights. Their depiction is one of the paradoxes of astronomy, and of the Cosmos watch, since the constellation to which the Earth belongs is the only one that is not visible, because it is hidden by the blinding sun. Finally, the celestial globe displays the constellation of the zodiac that is invisible at noon on the dial side and the one that is visible at midnight on the caseback side.